Hawaii is many things to many different people. To the film buffs, it’s the site of Isla Nublar, the fictional island in Jurassic Park and Jurassic World. To the surfers, it provides the thrill of riding some of the best waves in the world. To tourists, it’s a bucket list destination of tropical beaches, lush nature and constant rainbows that earns them bragging rights as Hawaii is one of the most remote places in the world. To astronomers, Hawaii is the closest and clearest point to the universe. And to volcanologists, it’s one of the best places to study volcanoes. Sure, there are lots to see and do in Hawaii, especially since the archipelago is made up of eight major islands, of which six are open to tourists, each with its own distinct appeal. But do like the volcanologist and head to the many volcanoes in Hawaii. After all, what better place to learn about this fascinating geological phenomenon than the place that was created by the volcanoes themselves. Hawaii will dispel the myth that volcanoes are fearsome and temperamental. Those are true, to a certain extent, but there are two major types of volcanoes in the world. The stratovolcanoes, like Japan’s Mount Fuji and Italy’s Mount Vesuvius, are the ones you see in the movies, because their eruptions are big, angry and explosive. Then there’s the shield volcanoes of Hawaii, where the lava is thinner and tends to flow more gently. Hence, much safer and more pleasant to visit. The best part is, Hawaii is one place in the world where you get to witness the different stages of a volcano’s life cycle. An extinct volcano and one of the most iconic landmarks in Hawaii, the Diamond Head crater was formed 300,000 years ago. When viewed from above, it has a beautiful saucer shape. Today, it’s a popular hiking trail that’s moderately easy to conquer in less than two hours (round trip), save for the extremely steep 99 steps at the top end of the trail. From the summit, you get a postcard-perfect view of the Pacific Ocean, the scenic shoreline from Koko Head to Waianae, and of course, the world famous Waikiki beach of Honolulu. Because of this vantage point, the crater was once used as a military post, which explains the bunkers and the navigational lighthouse you see at the summit. In winter, if you’re lucky, you’ll be able to catch sights of migrating humpback whales out in the ocean. This massive volcano takes up three quarters of Maui island. And at its crater summit, many gather in the dark, all cocooned in thick winter jackets, to catch the most spectacular sunrise in Hawaii. At 10,000 feet, the temperature at the peak of Haleakalā can sometimes fall below freezing, especially in the wee hours of the morning before dawn – it’s not uncommon to find snow here as well. As the sun slowly peaks above the horizon, in its perfect yolk-like roundness and glow, you’ll be confronted with a stark volcano landscape that seems out of this world. With the barren slopes, the ash grey soil, the giant ant-hill-like cinder cones and the craggy rocks, it’s easy to convince yourself that you’re on the moon. This crater, however, isn’t a typical crater – it wasn’t formed entirely by volcanic activity, but through eons of erosion and lava flows. Haleakalā is a dormant volcano, with its most recent eruption dating back to a few hundred years ago. But away from this moonscape, Haleakalā National Park is a sprawling, diverse land that features streams, waterfalls and fresh water pools, as well as lush jungles and ocean coastlines. You can go on hikes, camp out in the wilderness, or search for the Milky Way in the deep of the night. Sunrise is the most popular activity here, and for that, you’ll need to wake up at 2am, take the two-hour drive up to the summit, and wait in the cold (starting from February, you need to book your spot at recreation.gov). But it’s worth every sleepy yawn and the shivering temperatures. Because when the sun is up, you’ll also get a bird’s-eye view of the Maui central valley. Jaw drop, guaranteed. Rivers of molten lava, all red and incandescent, make for a mesmerising sight that’s so primal and godly at the same time. It’s no wonder that according to local folklore, Pele, the goddess of volcanoes, lives right here at Kīlauea, the central attraction at Hawaii Volcanoes National Park on the Island of Hawaii, the biggest island in the archipelago. Kīlauea may be the youngest volcano in Hawaii, but it ranks among the most active in the world; it has been erupting continuously since 1983. You can hike to the current lava flow but that’s a strenuous exercise that could take up to eight hours; otherwise, just head to the Jagger Museum (at 4,078 feet above sea level) in the park where you can observe the spurting lava lake at the summit crater from a comfortable and safe distance. Bonus: the observation deck is open 24 hours a day. 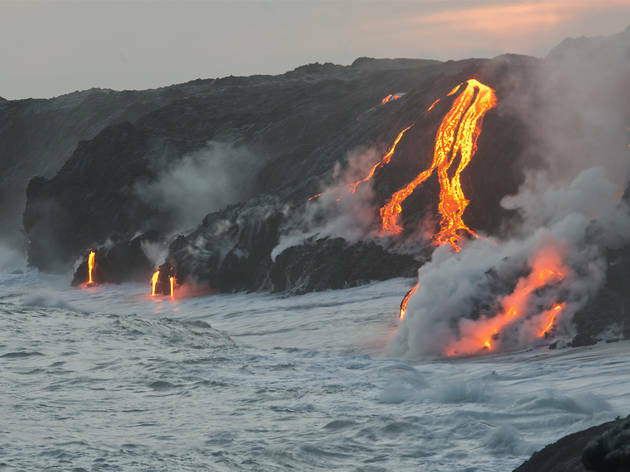 As the lava has recently began flowing into the ocean (thus adding more land mass to the island in the process), you can also take a boat ride out to see this rare phenomena. 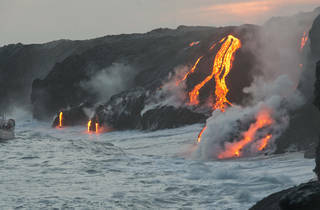 Note though that you shouldn’t in any way disturb the molten lava as Hawaiians believe it’s the body form of the goddess Pele. Plus, it’s a federal offence. For a complete picture of a volcano’s ecosystem, it’s best to take on the Crater Rim Drive. En route, stop by the prehistoric lava tube, a massive cave-like tunnel formed by lava flow ages ago, and get a ‘facial’ at the steam vents that are caused by the interaction between the magma and the water deep underground. You’ll also want to stroll through the native giant fern tree forests in the park that look straight out of the Jurassic Age. Mauna Kea, a dormant volcano of great importance as a cultural and spiritual site for many locals, is also one of the foremost astronomical research centres in the world. This massive mountain (it’s taller than Mount Everest when measured from its base at the bottom of the ocean) serves as Hawaii’s highest peak with the clearest vantage point into the star systems. A tropical inversion layer has created a natural occurrence where clouds form below the summit, leaving the peak with dry and clear air that’s free of atmospheric pollutants, which makes for a clear view to the skies. Here you’ll find some of the world’s largest observatories and telescopes, and also, one of the most surreal sunsets as you find yourself standing high above the clouds. When night falls, the sky looks as if it has been sprinkled with gold dust. So for a full experience, it’s important to get a reputable tour operator (such as Mauna Kea Summit Adventures; see boxed text) that will not only set up telescopes for you to see the stars and planets, but also regale you with facts and stories about astronomy and navigation. Better yet if they provide arctic parkas because it’s freezing up there. And don’t be surprised if it snows. Strip off and make yourself comfory among the frothy bubbles and decadent designs of these 10 sumptuous soaks.